The aim of this consensus recommendation is to provide guidance to healthcare experts and physicians regarding clinical indications, execution and interpretation of [18F]-Fluorodeoxyglucose (FDG) Positron emission tomography/magnetic resonance imaging examinations ([18F]-FDG PET/MRI) for whole-body staging in oncology . PET is a noninvasive imaging technique that provides quantitative information on 3-dimensional distributions of radioactively labelled biomolecules (tracer) in tissues. [18F]-FDG is a tracer composed of radiolabeled glucose, which is the most common tracer for oncology imaging indications . For the majority of tumors, malignant cells display activated glycolytic pathways resulting in increased glucose utilization via upregulation of glucose transporter expression and hexokinase activity  . Thus, more of the glucose analog, [18F]-FDG, is taken up in metabolically active cancerous cells than in surrounding healthy tissues. 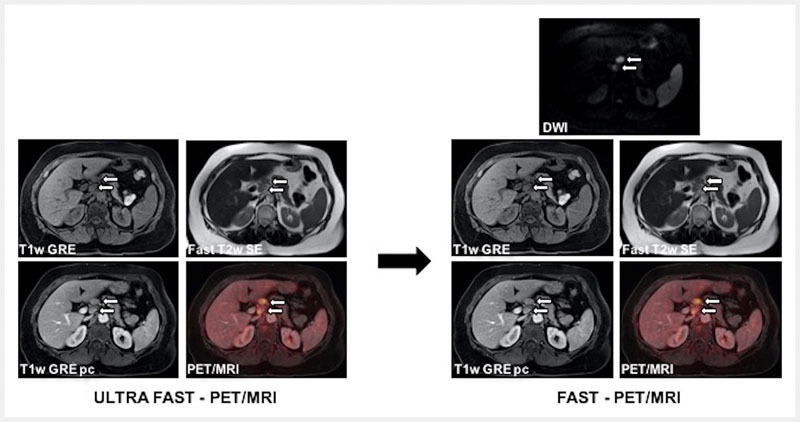 Therefore, [18F]-FDG-PET has been demonstrated to be a sensitive method and well-established imaging modality for detection, re-/staging as well as for the evaluation of therapy response of solid tumors  . Magnetic resonance imaging (MRI) is a noninvasive imaging technique that provides anatomical 3 D visualization of tissues with high spatial resolution based on relative differences in resonance frequencies of spins following external excitation . In addition, MRI employs multiple imaging sequences and associated soft-tissue contrasts that yield noninvasive insight into functional and cellular aspects of tissues and organs . The magnetic field-based excitation and resonance measurement method sets MRI apart from computed tomography (CT), which is a pure transmission method based on the attenuation of ionizing radiation. In contrast to CT-based transmission imaging, MRI does not employ ionizing radiation. Thus, the exposure of patients undergoing PET/MRI to ionizing radiation originates from the PET portion only and therefore is significantly lower compared to PET/CT . While attenuation correction is a well-established aspect of PET/CT imaging, it was a methodologically challenging task to overcome in integrated PET/MRI (please also refer to the section “Attenuation correction”). Thus, the introduction of MR-compatible PET detector systems provided the basis for the hardware integration of PET and MRI components into a single, integrated system  . Prior work of developers of small-animal imaging systems  has helped to replace the photomultipliers in PET detectors with semiconductor-based diodes that are capable of amplifying the scintillation signal in the scintillator crystals without being affected by the magnetic field . Following further technical and methodological work, fully integrated PET/MRI systems have been introduced for clinical use with a magnetic field strength of 3 T  and MRI sequences were developed that enable a reliable correction of attenuation artifacts in PET with comparable quality to CT transmission maps for PET/CT imaging (please also refer to section “Attenuation correction”). At present, the number of clinical studies with PET/MRI is continuously increasing. Recent publications comparing the diagnostic accuracy of whole-body PET/MRI demonstrated equivalence to that of PET/CT (using the same tracers)  . However, a number of potential benefits for PET/MRI have been highlighted with regards to the high soft-tissue contrast of MRI and consecutively improved delineation of tumorous lesions    . Such studies will benefit from overcoming of the existing variations in the use of PET/MRI for distinct diagnostic questions , and, therefore, consensus recommendations are mandatory to limit these a priori variations through harmonization and standardization approaches. A combined PET/MRI system is an integrated PET and MRI system that enables the generation of PET and MRI data during the same patient acquisition without the need to reposition the patient between examinations. Fully integrated PET/MRI refers to a hardware combination of both imaging systems that permits the simultaneous acquisition of PET and MRI data, requiring the use of MRI-compatible PET detectors. PET/MRI and MR/PET can be used interchangeably. The same is true for PET-MRI and MRI-PET. The information contained in the images from a PET/MRI examination is given by the tracer-of-choice, the method of acquisition of the emission data (static or dynamic mode) and the mode of the MR acquisition (T1-weighting, T2-weighting, dynamic contrast-enhanced sequences, proton density, diffusion-weighted imaging, arterial spin labelling, apparent diffusion coefficient, etc.). In the clinical routine, PET/MRI examinations do not include a transmission measurement, and, therefore, alternative means have to be provided to derive attenuation correction factors (ACF) for the PET data in order to quantify the molecular signals . Artifacts comprise all types of PET and MR image distortions that include visually perceived deviations from typical representations of anatomy and function that may or may not cause a quantitative bias (e. g., lesion size, tracer concentration, etc.). These distortions are likely not to arise from a disease process but from methodological pitfalls or system malfunctions . The following indications/application fields apply to whole-body [18F]-FDG-PET/MRI examinations in oncologic imaging. Patients are advised not to eat or drink any food (excluding water) four to six hours prior to the application of [18F]-FDG in order to reduce physiologic blood sugar levels and ensure low serum insulin levels. Sufficient hydration is recommended. Parenteral nutrition or glucose-containing infusions also have to be discontinued four to six hours prior to the application of the radiotracer. If the use of MR contrast agents is planned, the respective contraindications and applicable restrictions (e. g., potential allergic reactions to Gadolinium-based contrast agents, kidney disease or renal dysfunction) must be taken into consideration. Caution needs to be taken in the case of elevated creatinine levels or reduced glomerular filtration rates, indicating renal insufficiency  . Patients have to discard all removable metal objects (e. g., rings, piercings, medication pumps, etc.) before entering the PET/MRI examination room. In case of implanted ferromagnetic devices (e. g., pacemakers, ICD, LVAD, event recorders, stents, metal plates from orthopedic interventions, etc.) or metal splinters/shrapnel, PET/MRI examinations should only be performed after consultation with a radiologist/MR physicist and in accordance with MR safety guidelines  (please also refer to the section “MRI safety”). Blood glucose levels should be determined prior to [18F]-FDG injection. In case of hyperglycemia, [18F]-FDG uptake into the tumor may be decreased. Hence, in case the glucose level is above 150 – 200 mg/dl, the examination should either be rescheduled or appropriate insulin medication (including monitoring of blood glucose levels to ensure appropriate levels) should be considered . Patients should rest comfortably in a reclining chair or on a bed. Patients should not speak or engage in physical activity during the uptake time of the tracer following tracer injection. Please refer to the guidelines in Nuclear Medical Imaging (AWMF Guidelines Register 031/030) regarding general precautions for the application of [18F]-FDG . Prior to the imaging examination, patients should be asked to void. For patient safety, all patients should be routinely checked and screened with standardized checklists for potential MR contraindications (e. g. pregnancy, previous contrast agent reactions, catheters, ports, metallic implants, vascular stents, active implants, cardiac pacemakers, etc.) . All metal objects (e. g. dental prostheses, clothing with zippers and buttons) should be removed from the patient and cotton clothing without metal should be provided to the patient. Regarding implants, the specific kind of implant, its location, and its material need to be investigated beforehand. Information about the MR compatibility and safety of an implant can be assessed from the implant pass and/or directly from the implant/device manufacturer (e. g. online sources). The following safety regulations apply and should be adhered to: “MR unsafe” – absolute contraindication; “MR conditional” – relative contraindication, conditions apply; “MR safe” – no contraindication. In case of “MR conditional” implants, all conditions (e. g. max. field strength, SAR limitations, etc.) as provided by the implant manufacturer and online sources must be reviewed and applied during the MRI (PET/MRI) examination. In case of “MR unsafe” implants, the indication for the PET/MRI examination needs to be scrutinized and other imaging options should be considered. Beyond safety concerns, implants may cause artifacts, large-volume signal voids and geometric distortions in MR imaging. This may hamper image interpretation. In contrast to CT-based attenuation correction (AC) in PET/CT , the attenuation properties of tissue cannot be derived directly from complementary MR images. Therefore, different concepts of MR-based attenuation correction have been introduced . The most commonly applied method is based on a two-point Dixon technique, which facilitates a 4-compartment-model attenuation map (μ-map) to identify air, lung tissue, fat, and soft tissue   . Based on this segmentation of MR images into distinct tissue classes, the individual compartments are assigned a predefined linear attenuation coefficient (LAC) for the corresponding tissue   . A number of challenges including the systematic underestimation of PET quantification related to standard MR-based attenuation correction have been reported, the most prominent being the lack of consideration of bone tissue and the occurrence of truncation artifacts   (for further information please refer to the section “Artifacts”). Different compensation approaches for brain and whole-body imaging have been proposed to account for the misclassification of bone tissue as soft tissue  . Promising results for whole-body imaging were shown when utilizing a CT-based 3-dimensional bone-model of major bones as an adjunct to MR-based AC data    . Following the introduction of integrated PET/MRI systems, a number of artifacts have been reported that are related to PET-only, MRI-only or integrated PET/MRI acquisitions. A selection of the most common artifacts and potential solutions is discussed in the following paragraph . The most evident artifacts have been shown to be related to MR-based attenuation correction, causing a systematic underestimation of PET quantification when compared to PET/CT  . Apart from the misclassification of bone tissue (please refer to the section “Attenuation correction”), truncation artifacts are a major concern in integrated PET/MRI. Due to the limited transaxial and lateral field of view (FOV) in MR imaging to a spherical diameter of about 50 cm, structures beyond these dimensions show geometric distortions and signal voids, resulting in truncation artifacts alongside the patient arms and incorrect PET quantification  . In addition to the PET-based MLAA algorithm (maximum likelihood estimation of attenuation and activity) deriving the patients outer body contours from PET data  , a novel purely MR-based truncation correction method was introduced by Blumhagen et al.  . This method, also referred to as HUGE (B0 homogenization using gradient enhancement), enlarges the lateral FOV in MR imaging beyond the conventional 50 cm diameter, effectively eliminating truncation artifacts along the patients arms in MR-based attenuation correction  . Involuntary patient and organ motion causing a misalignment of emission and attenuation data is a known challenge in PET/CT imaging that may be further enhanced in PET/MR imaging due to prolonged examination times. Unlike in PET/CT and owing to simultaneous PET and MR data acquisition, PET/MRI has potential for MR-based motion correction of PET data. Different methods for motion correction have been proposed to account e. g. for respiratory motion artifacts including real-time MR imaging and 4 D MR data of breathing motion or free-breathing MR imaging to retrospectively perform motion correction   . In PET/MRI, AC is based on MR imaging. Thus, artifacts in MR-AC have a direct effect on PET quantification. Consequently, MR-based AC needs to be accurate and free of artifacts to provide precise PET quantification. MR-AC images shall be routinely checked for artifacts, consistency and plausibility during PET/MR image reading. Typical artifacts are mis-segmentation of air/soft tissue/fat/bone and metal artifacts due to dental prostheses and due to metallic implants such as stents and surgical clips, etc. Artifacts may be displayed as signal voids, exceeding the true dimensions of metal inclusions. Thus, artifacts are mostly easily detectable in MR-AC, indicating regions of potentially inaccurate PET quantification  . While new features for the improvement of MR-AC are constantly developed and implemented into the commercial software of available PET/MRI systems, including high-resolution Dixon AC, ultrashort echo time (UTE), zero TE (ZTE) sequences and/or bone models for bone detection in PET/MRI attenuation correction    , users need to remain attentive to MR-AC related limitations and artifacts in SUV quantification. Truncation artifacts along patient arms in MR-AC may affect PET quantification. The standard method on all available PET/MRI systems for truncation correction is the PET-based MLAA algorithm . A more recent method for improved MR-based truncation correction in MR-AC is HUGE   . Only radiofrequency (RF) coils that are labelled for combined PET/MRI use should be used. Using standard RF coils that are labelled for MR-only use will not be considered in PET/MRI AC and may, thus, lead to inaccurate PET quantification and artifacts in PET  . Quality control of PET tracers is governed by the “Draft Guidelines for Radiopharmacy” . Quality control and application recommendations for MR contrast agents are addressed in the guidelines of the European Society of Urogenital Radiology . Quality control procedures for the PET and MRI subsystems should be set up in accordance with the published guidelines   but shall at least follow the vendor’s recommendations. In addition, proper cross-calibration of the PET system with the respective dose calibrator has to be ensured. In routine operation, daily quality control scans (using a dedicated phantom) shall be conducted prior to patient scans to ensure correct PET acquisition and quantification. Imaging workflows may vary with the clinical indication. Similar to PET/CT imaging in oncology, PET/MRI can be performed in whole-body mode, meaning that patients are scanned over multiple, consecutive bed positions to cover larger co-axial imaging ranges. Given the extensive variability of MR imaging protocols and the choice of MR sequences, whole-body PET/MRI examinations have been shown to take longer than PET/CT examinations of the same co-axial imaging range. Therefore, the need for optimized and standardized PET/MR imaging workflows has become widely recognized. Over the past years, a number of proposals have been published  . This document sets out to describe suitable imaging conditions and protocols for whole-body [18F]-FDG-PET/MRI of oncology patients. Of note, specific protocols and MR sequences are subject to change depending on the user, vendor and indication for the examination. For reasons of simplification and conformity to PET/CT imaging, all workflows mentioned below apply to whole-body coverage from skull-base to mid-thighs. This coverage is usually achieved within four to five bed positions (BP) depending on the patient height. Accordingly, a combination of dedicated (attenuation-corrected) radiofrequency (RF) head and neck coils and a varying number of phased-array body surface RF coils are utilized as needed . Imaging is commonly performed in a supine position starting from mid-thigh to skull-base to ensure minimal impairment of lesions in the vicinity of the bladder due to increased [18F]-FDG activity in the bladder. In a first step MRI localizers are acquired to define the axial range for the examination. Pre-scanning of the shimming and adjustment of the magnetic field are followed by the attenuation correction (AC) sequence for every BP (for detailed information regarding MR-based AC please refer to section “Attenuation correction”). This workflow is based on a 2-min/BP acquisition that facilitates ultra-fast “PET/CT-like” whole-body staging within a total time of just under 20 min . The reasoning for this specific algorithm is to facilitate ultra-fast whole-body staging, e. g., in patients with low compliance (e. g. elderly, pediatric) or as a whole-body coverage adjunct to local dedicated imaging (e. g., local dedicated tumor staging in head and neck cancer or soft tissue sarcoma + whole-body ultra-fast). Indications for this ultra-fast workflow include whole-body staging, e. g., for lymphoma or staging and exclusion of relapse of tumors. Potential sequences to be obtained within the 2-min PET include: (1) Fast T2-weighted spin echo sequence (e. g. HASTE) and (2) non-enhanced fast fat-saturated T1-weighted gradient echo sequence (e. g. VIBE). Contrast media injection and acquisition of post-contrast fast T1-weighted fat-saturated imaging may be performed subsequent to the non-enhanced sequences. In case of primary tumors (e. g. malignant melanoma, neuroendocrine tumors) known to cause hyperarterialized metastases of the parenchymatous organs, additional dynamic contrast-enhanced imaging of the upper abdomen (e. g. VIBE) can be added. The combination of the sequences above enables the combined assessment of T2, non-enhanced and contrast-enhanced features of potential lesions ([Fig. 1]). Fig. 1 Schematic workflow for the ultra-fast whole-body [18F]-FDG-PET/MRI. This workflow is based on a 4-min/bed acquisition that comprises diffusion-weighted imaging (DWI) in addition to the above-mentioned sequences listed in the ultra-fast algorithm ([Fig. 2])  . The additional diffusion-weighted sequence offers complementary tissue information to PET and may be applied as a “search” sequence as it is considered useful particularly in the detection of small lesions, e. g., liver metastases that may be too small to be picked up by PET. Together with potential post-contrast T1w gradient echo sequences, this “fast PET/MRI” algorithm should require less than 30 min depending on the total amount of BP and duration of shimming, etc. ([Fig. 3]). Fig. 2 Imaging example of a 45-y/o patient with a celiac lymph node metastasis (white arrows) imaged in ultra-fast and fast [18F]-FDG-PET/MRI. Fig. 3 Schematic workflow for fast whole-body [18F]-FDG-PET/MRI. This workflow comprises dedicated local PET/MRI of the tumor region (e. g., head and neck, cervical cancer, soft tissue sarcoma of the limbs) and fast sequences for whole-body coverage. The aim of this workflow is to facilitate a dedicated workup of the primary cancer and whole-body staging in one examination. The MR protocol for the dedicated local PET/MRI scan should be selected in accordance with the primary tumor and guideline recommendations (e. g., cervical cancer ). Whole-body imaging can be performed utilizing the above-named ultra-fast or fast algorithm depending on patient compliance, potential benefit derived from DWI and desired length of the examination ([Fig. 4], ). Fig. 4 Schematic workflow of dedicated local [18F]-FDG-PET/MRI + whole-body staging. Fig. 5 Imaging example of a [18F]-FDG-PET/MRI scan of a 52-y/o patient with a large soft tissue sarcoma of the left lower limb (thick arrows). The figure displays the dedicated local PET/MRI protocol a for assessment of the primary tumor and the fast protocol for whole-body staging b, revealing an iliac lymph node metastasis in the left hemipelvis. The following recommendations on reading and reporting are intended to serve as assistance to novice PET/MRI readers and help standardization. High quality reading and reporting of PET/MRI examinations is based on expert knowledge of PET and MRI imaging . Hence, PET/MRI reading should be performed jointly by a radiologist and a nuclear medicine physician or by adequately trained dual-certified physicians (nuclear medicine and radiology). It is important to evaluate the “raw” MRI and PET data as well as fused imaging. In contrast to rather distinct differences in the required expertise and duration of reading MRI versus CT, PET/MRI reporting can be conducted similar to PET/CT reporting. After reporting of the definition of the exam, clinical information, examination procedure and key parameters (including the applied radioactivity, uptake time and amount of contrast agent), the actual report, in terms of imaging findings and their evaluation, can be written as an integrated (conjoint description and evaluation of findings in MRI and PET) or separate report (subsequent description of findings in MRI and PET and conjoint evaluation). Since its introduction in 2010, whole-body PET/MRI has become well-established in scientific and clinical imaging. Still, a number of basic, methodological and professional challenges have limited its wider general acceptance in the oncologic community as well as its utilization as a diagnostic alternative to PET/CT. The greatest obstacle is caused by extensive and heterogenous protocols that have rendered PET/MRI a research tool that is incompatible with clinical use and is economically challenging. Thus, we introduced recommendations on workflow options that offer efficient and fast imaging protocols open for adaptation to meet the purpose of the examination. The three categories of imaging protocols above allow the standardization and harmonization of PET/MRI, which is a prerequisite for multi-center trials and the assessment of large patient cohorts. This may support the future adoption of PET/MRI in clinical routine imaging and institute reimbursement. Dr. Herrmann reports personal fees from Bayer, other from Sofie Biosciences, personal fees from SIRTEX, other from ABX, personal fees from Adacap, personal fees from Curium, personal fees from Endocyte, grants and personal fees from BTG, personal fees from IPSEN, personal fees and non-financial support from Siemens Healthineers, non-financial support from GE Healthcare, outside the submitted work. The other authors declare that they have no conflict of interest.